I had some issues with other lines in the past and had found a couple of braid lines that I liked and had confidence in. The other lines either broke or I would consistantly get wind knots from hell. Being a “team player” I decided I would spool a reel up with it and give it a shot. So I loaded the High Vis yellow 10 lb. test line (a 2 lb. mono equivalent in diameter) up on my Quantum 40. As I loaded it onto the spool I noticed the texture of the line was a mite bit stiffer than the other lines I used. I was concerned with the casting distance but to my pleasure the relative stiffness of the braid really didn’t have any affect on the distance. One concern down, three more to go. The other concern was the dreaded wind knot. 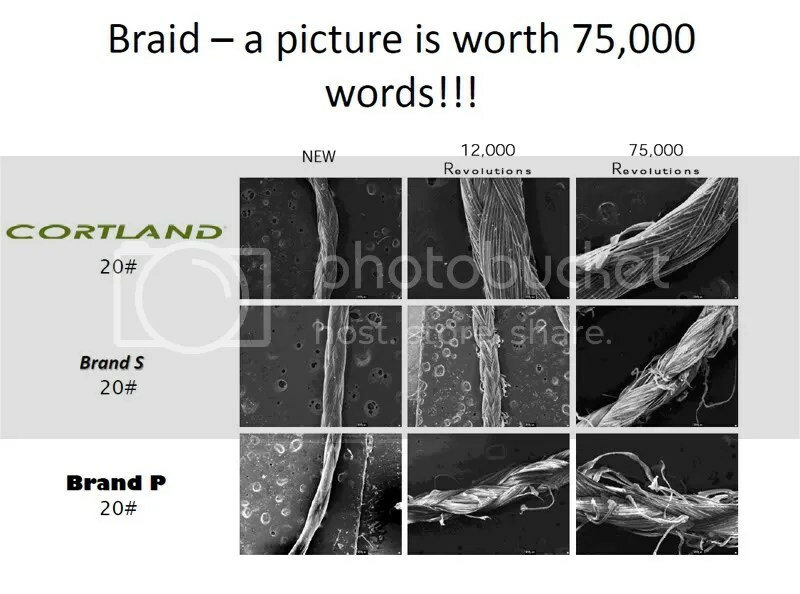 Sometime ago I had my first experience with braid that resulted in taking every bit of braid off all my lines because of knots. I had just begun to untie a knot that looked more like an osprey’s nest as opposed to just a bird’s nest. Off to my left they came….the water column rose up and a band of marrauding reds swam by within casting distance. That is what should have been casting distance if I didn’t have that darn knot. I was made sport of by those reds that day as they mocked me and some even flipped me off with their fins. Sometime after that I “discovered” the Stren and at Sammy’s urgeing I incorporated the Suffux into my arsenal…my wind knots were relatively a thing of the past. Much to my pleasure the Cortland Master Braid did not manage one single knot. Not one. The package says “Twist Free” I believe it. Now, I must admit, I usually close the bail manually just as the lure or bait hits the water but the conditions ranged from very windy (in excess of 25 mph) to quite cold (40’s). Point well taken. This Courtland did manage to bring in a couple of nice reds about that size and a few sharks a bit larger than that. A couple of times I did see the tailfin slap the braid. It held up. Three down. Sorry for the pic quality, but if you look closely you can see the yellow Cortland Master braid on the reel. This was right after a three foot shark had tail whipped the line. Not even a mark was left on the line. The final test is the overall durability of the line. Through those skirmishes the line had not shown any sign of wear… none. Furthermore, Sammy has been using this line since July and sees no wear at all.It looked as it did when I first put it on the spool. Four down. I was able to get these results from a test that may show clearly what I have been trying to say. As I complete this review the words I had heard before ring in my ears, “This is the best line you have not heard of.” Hopefully, we will change this. This line passed my tests and I think that it may pass whatever tests you may have for it. Keep visiting SaltyShores regularly because soon we will be testing their fly lines and also blue water heavy test braid.